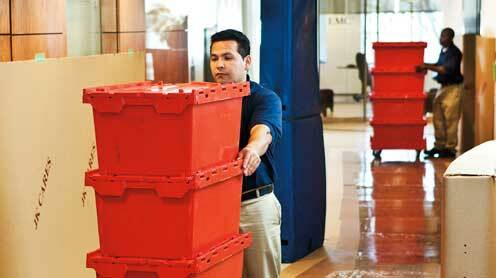 Do you just specialize in office moves, or do you move other types of companies as well? The answer should be, “yes.” A professional movers will have experience moving all different types of businesses including offices, laboratories and hospitals, hotels, restaurants and bars, to libraries, schools, museums, and more. Are you certified by IOMI? The answer should be, “yes.” Only get estimates from commercial moving companies certified by IOMI (The International Office Moving Institute), the world’s only university for commercial moving. Hiring an IOMI-certified mover ensures that your company will get packed, loaded, and moved with the least amount of disruption and downtime to your bottom line. Do you have services and solutions to minimize disruption? The answer should be, “yes.” A good professional mover will have services and solutions to minimize disruption before, during, and after the move. The answer should be, “yes.” Beware: There are movers out there who will pick up untrained, part-time crews at your local convenience store. Make sure your commercial moving company only uses full-time, fully-trained crews dedicated to commercial moves. The answer should be, “yes.” Unless you’re moving your organization halfway around the world, the same crews should handle your move from start to finish. Will my old office and new space be protected during the move? The answer should be, “yes.” Critical areas, including carpets, floors, doors, woodwork, doorjambs, and elevators should be protected. How about computers and office furniture – will those be protected? The answer should be, “yes.” If your moving company is IOMI certified, crews will know exactly how to protect everything from computers, servers, and other office equipment, to furniture, artwork and more. The answer should be, “yes.” A good mover will provide you with computerized tracking so that you can find out where your company’s assets are, wherever they are in the world. Do you store office furniture and electronics? The answer should be, “yes, in a well-maintained storage facility.” Most moving companies offer tours of their facilities. Simply ask to see them in person. And if that’s not possible, you might also be able to take an online tour. Do you store documents and records? The answer should be, “yes.” A professional mover should offer records storage and document management solutions, where records and files will be kept safe and sound. Make sure your company also offers easy access. The answer should be, “yes.” A full-service commercial mover will offer shred-on-demand services, as well as weekly shredding programs where pick up is included. Can you handle the furniture and electronics that I don’t want to take with me? The answer should be, “yes.” A solid moving firm should offer purge services, where they can remove old, unwanted items for you. Are your moving practices sustainable? The answer should be, “yes.” There is no planet B. So make sure your moving company helps to make moves easy on you and the earth.